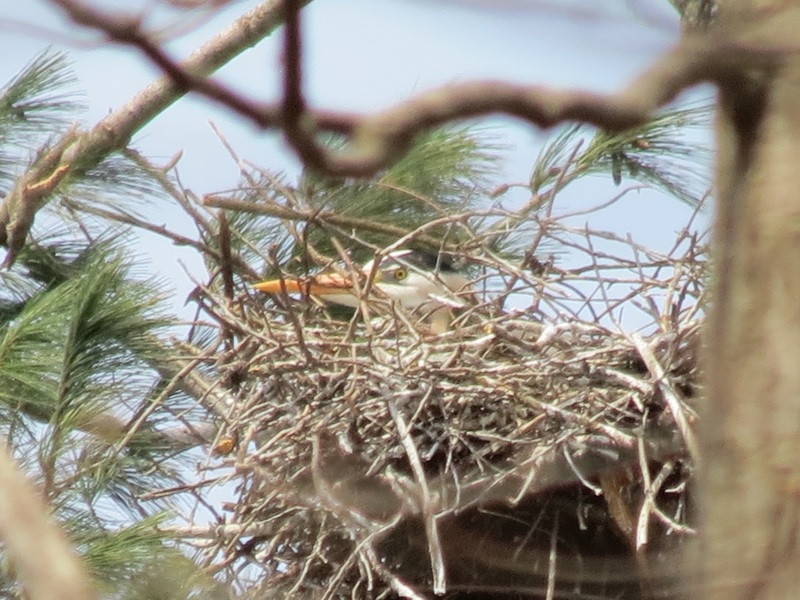 Above is my neighborhood Great Blue Heron on the nest..You can just barely see the heron's beak and eye. My view with the camera will disappear as soon as the leaves show up on the trees. But, it is cool to be able to watch their progress. One of the local breeders the American Goldfinch.. The male is already showing off his pretty summer colors. 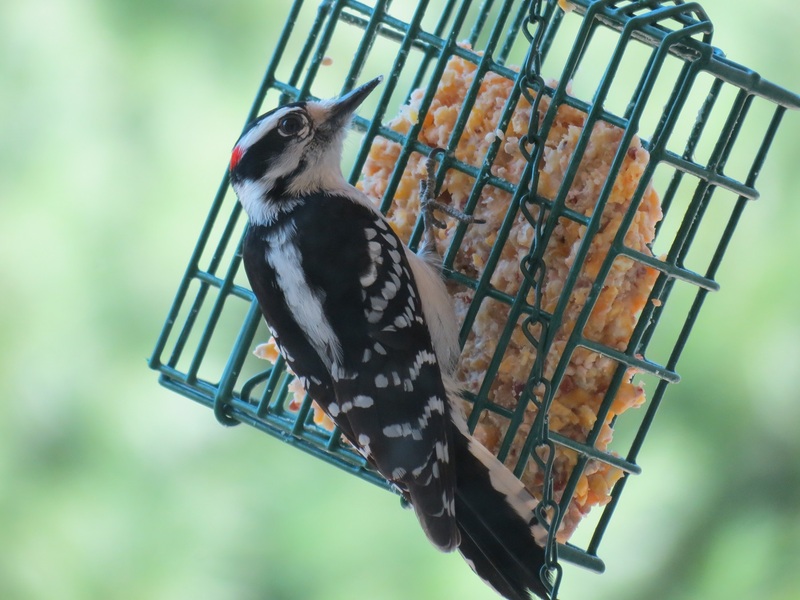 A male Downy Woodpecker outside our dining room window.. I hope you enjoyed my birds, they are always a treat for me. Thank you for linking up to the critter party. I appreciate the visits, comments and the support of my blogging friends..I am looking forward to seeing your critters. Please visit: I'd-Rather-B-Birdin. Thanks to the gracious host: Anni of I'd Rather-B-birdin. Also, sharing with Camera Critters. Thanks to Misty for hosting. Love your GoldFinches Eileen!! I love watching them flitter around - little specks of yellow from branch to branch. I've had the thistle out for nearly a year and they have finally found it! YEAHHHHH! I have little Goldies visiting now consistently everyday!! Nice Woodpecker shot too!! The yellow fellow is a cutie and the woodpecker always reminds me of our kookaburra's to look at. They all look happy that Spring has sprung. Can't get over a big bird like a heron can sit in a nest on a tree branch. Eileen ... Have a very Happy Easter. Such beautiful birds! !Great shots and captures! !Lovely bird the Woodpecker! !Wishing to you and your family a Happy Easter! !Enjoy your holidays!Hugs! Our goldfinches have completely disappeared--and I guess I didn't realize that until I saw your photo. We usually comment on their "mottled" coloring until they fully turn. Hmmm. I wonder why they are gone? Anyway, hope you have a Happy Easter, Eileen. Great series of pictures, especially the yellow bird is great. Thanks for hosting the critter party Eileen.Your pictures are just super today. Love the peeping heron - enjoy while you can. 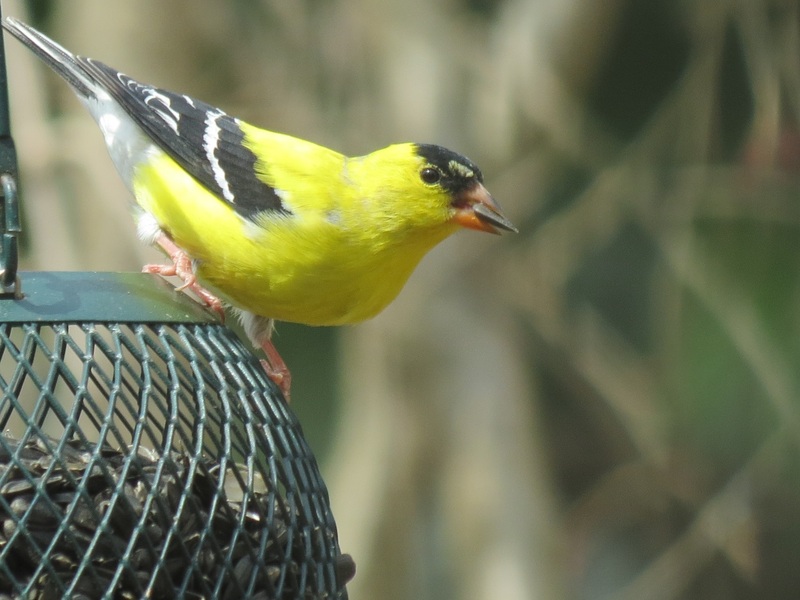 The American Goldfinch is certainly in wonderful Spring attire, and so is the Downy 'pecker. Happy Easter. those little yellow birds are the perfect color for Easter week end. Happy Easter Eileen -- and thank you for the weekly gift of this meme! Spring is looking wonderful in your yard ... lovely birds. Nice set of these beautiful birds .. Have a great day..
Love love your goldfinch, and your birds. Wonderfull fotos and birds Eillen, happy Easter. Our goldfinches are not so bright yet. Lovely photo, Eileen. 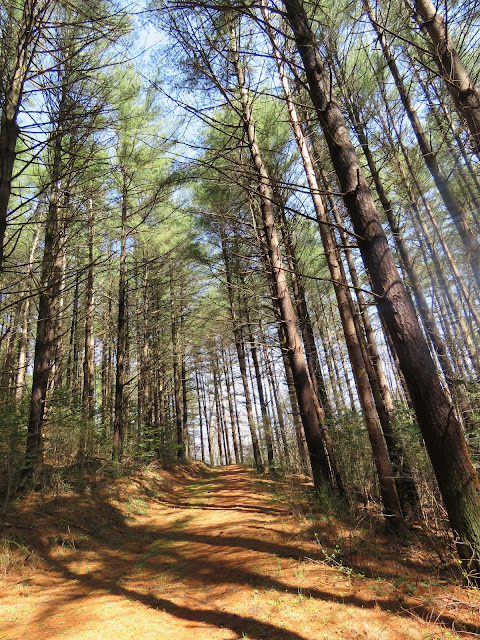 Nothing like loosing the view when the trees grow, but nature has to move on. How wonderful to have a great blue heron nest to spy on :) The goldfinches look splendid in their bright yellow feathers. I'd love to find a heron rookery. We have them, but they're difficult to locate. The finches have really brightened up! Nice shots! I love the goldfinch, he's so pretty! Happy Easter! Thanks for commenting on my Mission shot. I hope you have a great Easter. Wonderful photos of birds ! I always enjoy the Goldfinches, but we haven't had any show up yet. Tomorrow, I'll come again after reading your blog and visit other friend. Good night for tonight, from Japan. oohhhhh i just love "yard" birds, the ones that come to us for a visit and pictures!! the male goldfinch is almost at peak and he is looking mighty fine!! ps...close call with brian, good thing i slept a lil longer today!! how exciting you get to watch the great blue heron nesting so close to your home. i have a friend who took me where she'd found 8 nesting herons. what a sight that was. i got lots of pics. i may have to start sharing some of them for your Saturday Critters and for Wild Bird Wednesday... your goldfinches are pretty. i have about four different ones showing up at my feeder so far. i wish a woodpecker would come to my feeder but alas... none yet. hope all is well. have a great weekend. really love that you have the herons nesting nearby! i've never seen one here. and your goldies are beautiful! Beautiful birds, my fave is the Downy Woodpecker, fantastic. Beautiful finches. Would love to find a blue heron nest. Lucky you! exceptional photos what kind of camera?? Great shots, Eileen. It will be really exciting to watch the heron chicks grow. Love your little backyard visitors. Have a nice Easter! Love the shot of the heron peaking through the nest! The goldfinch here as just starting to get their color. Pretty birds. Awesome captures, Eileen. Beautiful images Eileen! You have some wonderful neighbourhood birds! Some of my favourite birds in your post, Eileen. I, too, have been watching the action at a heronry (Stanley Park). Thanks for this fine meme! The Heron pic is awesome! I'm never able to get any pics of the woodpeckers in these parts. Back when I was living in Burton a few months ago, I named one of them "Sir Wickel" but never got a pic of him. It's a shame you will soon lose your view of the heron nest, but it's great that you can see it at all. We've got lots of pretty goldfinch at our feeders nowadays. Fantastic bird pics - especially the "peekaboo" heron. Happy Easter! Love the bright yellow birds! That downy woodpecker is adorable! I saw one yesterday, but didn't get close enough to get a good pic. I so love to see your birds. They are always so colorful and pretty. I certainly enjoy the woodpeckers a lot. The Goldfinches are flashy little things, aren't they! My eyes like the patterns on the Woodpecker even more though! For sure I enjoy your birds! So I am happy to see yours! Was great seeing that blue Heron in the nest ! 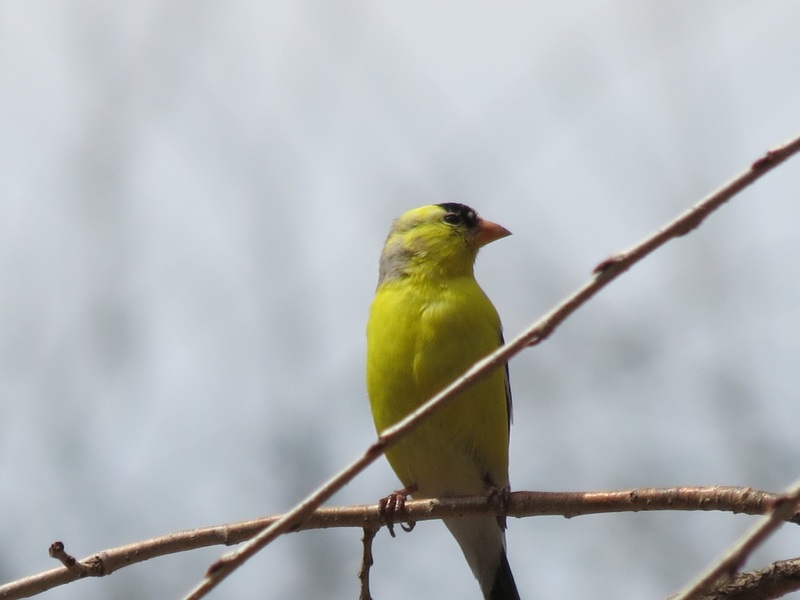 Beautiful photos of the American Goldfinch! I don't see many of them sorry to say. The blue heron is very easy to see in his nest, but only the yellow males putter I find beautiful. woodpecker also have very nice man know to photograph. Bravo! Sorry for my late response but I had last week, from Sunday afternoon toto no internet. Lovely instants with birds, once again! Please excuse me that I have no reference to the wonderful world of critters, only a stone yellow bunny that it seems "so lost among coloured eggs"... lol... but I want to say thanks for sharing!! All the best! Love the wood pecker. Never seen it before. Beautiful shot. How wonderful to have herons nesting nearby. Your birds are beautiful. I love the yellow of the Goldfinch! The Heron is so cool. Love that little Goldfinch, it's Washington State's, state bird.